One of the most ignored parts of a home décor is often the curtains. However, the curtains have the capacity to influence the entire look and feel of the room. Whether a room looks cozy and compact or it looks open and spacious, it all depends on the way the curtains have been used in the house. These days, there are many other window shields that have come to the market which has perhaps impacted the market demands for curtains. However, curtains still rules the roost as the most popular choice for majority of the customers. Look for best designer curtain suppliers in India online. In this article we will explore how to use the right curtains to enhance the look of the room. Primarily, the main function of curtains is to provide a screen in order to protect our private space from the outer world. Curtains are also used at the doors to demarcate one room from the other. However, if you take a look at it from the point of view of home décor, curtains are one of the most important elements that can either make or break the entire look of your interiors. This is one element that needs to be balanced right in order to achieve a perfect equilibrium in your home décor. When it comes to home décor, the color of the home furnishing products decides some of major factors such as whether a room looks spacious or cozy. You can rather play with an optical illusion created by the curtains only if you know how to play. A big space can be curtailed down with the use of dark colored curtains. Similarly, a small space can also be made to look bigger by using light colored curtains. This is where the fabric, texture, weight and the tailoring details of the curtains come into play. It is extremely important to choose the right kind of fabric for your curtains. Firstly, they should neither be too heavy nor too light. Too light a curtain will not have an elegant fall and heavy ones will not come together in a nicely when drawn. Also the color should be chosen keeping in mind the exposure to the sun. Brighter colors tend to fade out easily. Hence, while choosing the color look out for the fact whether the room receive extensive sunlight or not. In such cases, it is safer to pick neutral colors which has a less propensity to fade and blends well with the room décor. The most common preferences when it comes to choosing fabric for curtains include silt, velvet, faux silk and linen. The most durable option among these is the faux silk while the quality of silk and lined may deteriorate with continual exposure to sunlight. Interlining the fabrics adds to the volume as well as durability of the curtains. When it comes to the design of the curtains, it is primarily the part of the curtain that is attached to the rod. 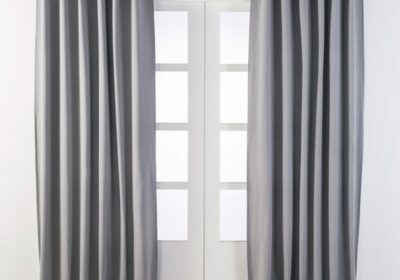 Simply get it hemmed to make the rod glide on smoothly into it, or create a hoop or rings – the way you tailor the curtains will have a direct impact on the look and fall of the curtain. Traditionally a full length curtain starts from about half a feet above the window and cascades to an elegant fall on the floor. However, nowadays, a lot of curtains are lefts to a length at just a few inches below the window. Curtain Fabric manufacturers in India offer plenty of options that can be customized as well as picked off the selves. « What Should You Look For While Buying A Bedsheet?